At a time when the game of baseball is hurting for stars and viewership, the World Baseball Classic came around the corner and provided yet another great showcase for America’s favorite pastime. Although there was much criticism going into the tournament, the results and success of the tournament prove that baseball isn’t dead. It’s doing just fine. Since the tournament was started in 2006, 16 teams from around the world compete to prove which country is the best. Stars from the MLB and other great baseball leagues around the world flock to their countries rosters in what can only be described as pride and dedication to their countries. The United States, however, has had problems with this in the past. Since 2006, the United States had been very unsuccessful in the World Baseball Classic. Falling short in the first three tournaments, the heads of baseball in America were out to prove they could hang with the other countries in the world and show why the United States was a country where baseball thrived. However, they ran into the issue of securing the best of the best in America. MLB all-stars Bryce Harper, Mike Trout, Clayton Kershaw, and Madison Bumgarner were all noticeable absences from the team roster and caused rumblings that the United States was set up for another failure in the tournament. The actual roster, however, had other plans for the tournament. MLB stars Adam Jones, Nolan Arenado, Chris Archer, Ian Kinsler, and so many others were out to prove they didn’t need those who truly didn’t want to be a part of the team. It was a mantra of the team that if you didn’t want to put 150% into the title efforts, don’t come at all and they proved right from the opening round. 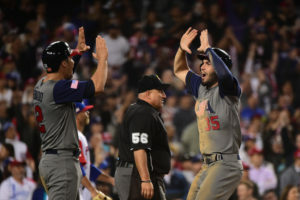 The United States opened their tournament with late game heroics from Adam Jones in the bottom of the tenth inning to defeat Colombia 3-2 in extra innings. However, things took a thing for the worse when team blew a 5-0 lead against the Dominican Republic, eventually falling 7-5. In what was essentially a must win game for the United States, they soundly defeated Canada 8-0 to move onto the second round of the tournament. The second round began with a bang as they captured a hard fought win as Adam Jones and Eric Hosmer hit homeruns in the bottom of the eighth inning. They, however, lost another tough game to Puerto Rico, setting up another must-win game. This time against the Dominican Republic. This time was different, however, as they captured a 6-3 victory, moving onto the final four of the tournament. After defeating Japan in the semi-finals 2-1, the United States was finally one game away from the elusive WBC championship. The only team standing in their way was the Puerto Rico team that had defeated them earlier in the tournament. The team wouldn’t be denied this time as starting pitcher Marcus Stroman threw a gem and the team soundly defeated them 8-0. This title win may seem inconsequential, but the United States winning the tournament is a huge step forward for baseball. This tournament gives plenty of momentum to the upcoming baseball season and promises to showcase that baseball, and its many stars, are still thriving.